Hurricanes are expensive for both home owners and the insurance industry. In 2004 and 2005, eight hurricanes slammed Florida, inflicting $31.3 billion in insured losses. Two Florida Sea Grant research projects are helping to reduce the economic impact of hurricanes on Florida’s vulnerable residential structures valued at $1.5 trillion. Roof panels treated with spray-applied polyurethane foam adhesives keep out 20 percent more water than untreated panels. Because much of the hurricane damage to homes comes from leaking roofs, David Prevatt, assistant professor of civil and coastal engineering at the University of Florida, seeks to make roofs more water tight. Prevatt has found that roof panels treated with spray-applied polyurethane foam adhesives keep out 20 percent more water than untreated panels. The spray foam also helps roof sheathing withstand wind uplift significantly more than conventional roof construction. While keeping damage at a minimum is essential to lessening a storm’s economic impact, knowing the value of what is at risk and having it properly insured is also an important money saving measure. To asses the value of buildings that could be lost in a hurricane, the insurance industry uses a computer program known as the Florida Public Hurricane Loss Model. However, until Florida Sea Grant researcher Arindam Chowdhury and his team at the Florida International University’s Wall of Wind hurricane testing facility stepped in, the model did not adequately account for interior building damage that results from strong storms and hurricanes. 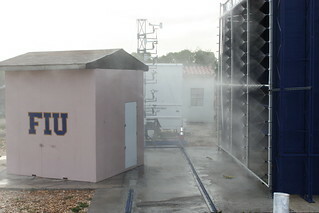 The Wall of Wind research facility at Florida International University is able to simulate rain water intrusion under strong storm conditions. These findings are being used to update Florida’s insurance loss model and have already resulted in the creation of new building codes in Miami-Dade County to strengthen the exterior components of residential structures.